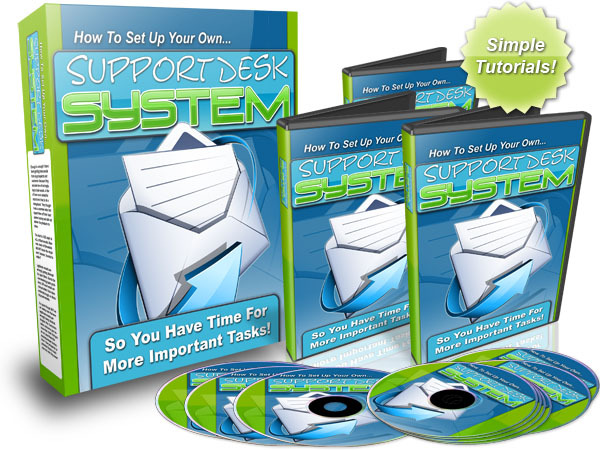 Support Desk For Free And Give Yourself Time To Progress Your Business!.. Enough is enough! I have been getting hate emails from my prospects and customers because they accused me of not replying to their emails. A few of them even asked for refund and tried to do a chargeback. They thought I was a scammer who had ripped them off their hard earned money and did not deliver the products to them. The truth is I DID reply to ALL of their emails. However, some of the emails did NOT reach the recipients' inboxes. Legitimate emails are wrongly getting blocked by spam filters. Due to the overwhelming spam problems, ISPs and email service providers have been extremely tough on blocking spam emails. It is good though BUT we are seeing now that even legitimate emails are wrongly being blocked. Customers swear and curse you because they claim that you do not send them the email download instructions. Your prospects or potential buyers reach your site and they seem interested in your product. But before that, they need to confirm with you something so they ask you some questions. You reply all their emails BUT somehow the messages do not reach their inboxes. Guess what? LOST SALES! -- LOST THEIR TRUST ON YOU! Surely you don't want to find yourself in that situation do you? That is why you must NOT rely on emails. Instead you should use a customer support system so that messages are 'written and read' on the webpage instead of going through emails. But installing a customer support desk system can be a daunting task! I've been in your situation before. I can't wait to get started making money online but as I progress on all the necessary tasks step-by-step, there seems to be HUGE obstacles along the way. I realize that I need many scripts and softwares to run and manage my business efficiently and effectively. One of the much needed scripts is an ad tracking script. After buying the script, I need to learn how to install it. And since I have no clue on how to do it, I hired a programmer to do the task. My 8-part video tutorials reveal how you can install a customer support system script in just less than an hour and start using it to keep in contact with your prospects and customers! In this video I'll walk you through where to get the free script, and then install it manually on your server. These include uploading of the script files using an ftp client and creating the MySQL database that is needed for this script to work. In this video I'll walk you through the steps of uploading the script files using cPanel® File Manager, without the need to use a 3rd party ftp client. In this video I'll briefly explain on the general overview of the admin area. This will be the area where you will configure the settings of your script. In this video I'll walk you through working with the email settings in the admin area. In this video I'll show you how to create the department, specify the number of staff and creating the help topics. In this video I'll briefly explain on how to work with the knowledgebase section. In this video I'll show you on how to change the logo on the header of the main page of the script. In this video I'll show you on how to edit the main page of the support ticket system. This is where your prospects and customers will go to each time they want to open up a support ticket. Now think about it. If you're not watching these videos, it may take you many hours or even weeks before you can finally have your support ticket script working properly on your server. At least I have experienced that. You may have tried reading books and manuals but they can only tell you how to do it on writing. You've still got to figure out how to do what you've been told! Why spend the next weeks and months trying to figure out all of the steps it takes to get your ad tracking script installed and set up -- when you can watch ME show you exactly how to take action and get it up and running today? So...with that said, don't walk, but run. Grab your copy of 'Support Desk System' now and take your business to the next level. Whether you technology phobe, or an experienced marketer, I guarantee that you'll gain some great information from this simple and easy to understand video series. YES Steve! I understand that I will be getting access to 'Support Desk System' straight after payment.